This information was transferred from the previous “Restoring Cornelia” website for you R-Series fans. On this page you will not only find the detailed specifications for the R-Series line, but information on the Silver Diamond engine and several other features of the pickups as well. If you have anything that you feel could be added, please contact us. 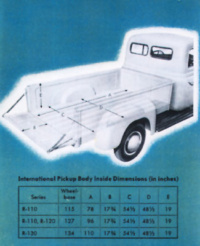 Gross Vehicle Weight Rating – R-110 – 4,200 lb. / R-111 – 4,800 lb. / R-112 – 5,400 lb. Nominal Gross Carrying Capacity (body, equipment and payload) – R-110 – 1,600 lb. / R-111 – 2,200 lb. / R-112 – 2,800 lb. Tread – front wheels, 60-1/2 in. ; rear wheels, 60-1/2 in. Road clearance – front axle, 8-1/2 in. ; rear axle, 8 in. Over-all width – front 76 in. ; rear 68-1/2 in. Height from top of frame to ground, loaded – front, 20-1/4 in. ; rear, 23-11/16 in. Frame: Pressed steel channel, 115 in. WB – 6 x 2-1/4 x 1/8 in. ; 127 in. WB – 6-1/22 x 2 17/64 x 9/64 in. Engine: International Silver Diamond 220, six-cylinder, valve-in-head type; 3-9/16-in. bore, 3-11/16-in. stroke – Displacement, 220.50 cu. in. ; compression ratio, 6.5; A.M.A. rating, 30.4 hp. ; maximum brake hp., 100 at 3600, net 90 at 3600 r.p.m. Maximum torque, 173.5 lb.-ft. at 2000 r.p.m., net 167 lb.-ft. at 1200 r.p.m. Four steel-backed, replaceable-shell, precision-type main bearings; total projected area, 17.01 sq. in. Six replaceable-shell, precision-type connecting-rod bearings. Exhaust-valve seat inserts. Lubrication: Full-pressure feed to all main, connecting-rod-and-piston-pin bearings, camshaft and timing gears. Gear-type, gear-driven oil pump. Oil capacity, 7 qt. Cooling System: Centrifugal pump circulation, fin-and-tube radiator. Pump drive by V-type fan belt. Capacity, 16-1/2 qt. Ignition: 6-volt, vacuum control, full-automatic distributor. Generator: 6-volt, 35-ampere, shunt-wound, belt-driven. Carburetor: Downdraft type. Oil-bath-type air cleaner. Fuel System: Mechanical fuel pump driven from camshaft. 15-gal. tank. Gasoline filter. Clutch: 10-in., single-plate, with vibration damper. 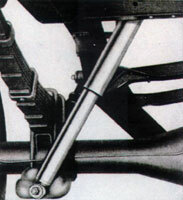 Transmission: Three speeds forward, one reverse; synchromesh, mounted in unit with engine, gear shift lever on steering post. Transmission Reductions: First, 3.053 to 1; second, 1.481 to 1; third, 1 to 1; reverse, 3.707 to 1. Propeller Shaft: Large-diameter, heavy-steel tubing. Universal Joints: All-metal, roller-bearing, antifriction type. Front Axle: Drop-center, I-beam, heat-treated steel drop-forging. Steering knuckles of drop-forged, heat-treated, chrome-molybdenum steel. 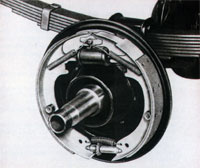 Rear Axle: Semifloating, hypioid type. Hotchkiss-type final drive. Chrome-molybdenum steel axle shafts. One-piece, tubular banjo-type pressed-steel housing. Differential and wheel bearings are tapered rollers. Pinion, straddle-mounted on roller bearings. Axle Reductions: 3.73 to 1 or 4.1 to 1. Brakes: Service: 4-wheel, hydraulic, internal-expanding, two-shoe single-anchor type. Hand: on propeller shaft. Springs: Front and rear, semielliptic. Front, 42 x 1-3/4 in., rear, 52 x 1-3/4 in. Standard Tires: 6.00-16, 6-ply P.C.-all models. Controls: Throttle, light, and choke controls on instrument panel. Accelerator, clutch and service brakes operated by pedals. Emergency brake lever-operated. Standard Equipment: Flat-back cowl and dash; sealed-beam headlights; combination tail and stop lights; air cleaner; front and rear shock absorbers; jack and handle; and spare tire. 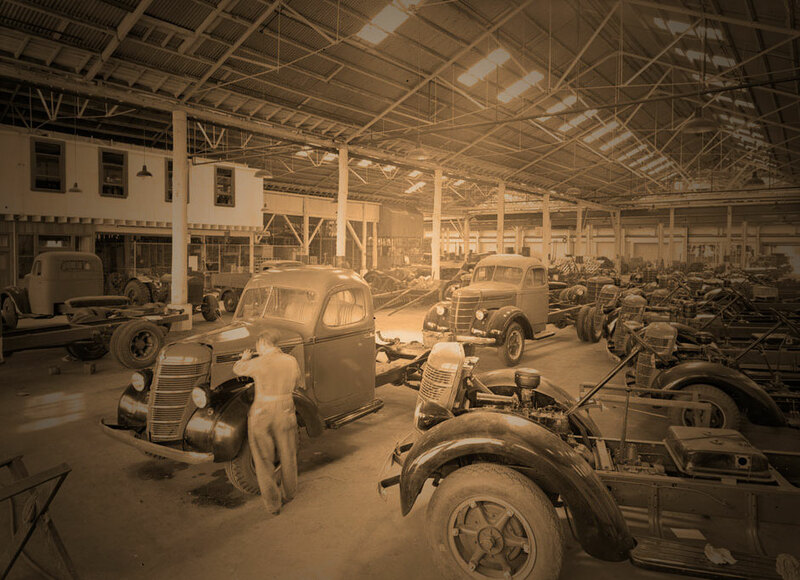 Special Equipment: The following will be available at extra cost when specified on order: regular cab; optional tires, 6-volt, 40-ampere, low-speed generator; heavy-duty 3-speed and 4-speed transmissions; oversize clutch; increased capacity battery; auxiliary springs; oil filter; increased cooling; pick-up, panel or stake bodies. Regular Cab: Standard equipment: ash tray; right-side door lock; floor mat; fixed left-side rear-view mirror; safety-glass windows and windshield; full-width spring-type seat and back cushion; left-side sun visor; dual-type right and left side vacuum windshield wipers; and ventilating wings. Optional equipment; green-tinted safety glass;left-side arm rest; dome light; fresh air or recirculating type heater and defroster; optional rear-view mirror; right-side sun visor; dual electric windshield wipers. Finish: Frame and wheels black. 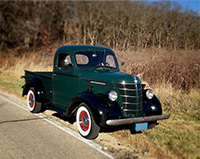 Grille, hood, cab and fenders, a variety of attractive optional colors.